Is your chimney sweep CSIA Trained? There’s a unique southern California description for a weather pattern that brings cool temperatures and clouds to a region of the world used to sunshine. It’s known as June gloom. We are experiencing the opposite at the Chimney Safety Institute of America in Plainfield, Indiana. At CSIA, our mission statement is to advance public safety while educating and certifying industry professionals. That’s not a seasonal philosophy — it’s year-round. And the summer is quite busy for education and training of chimney sweeps and other interested professionals — just one reason why homeowners trust us to take care (inspect/sweep) of their fireplaces, wood stoves, and chimney systems. Take the month of June, which kicked off with our CSIA Technology Center being host to a fine group of home inspector trainees from AHIT. They were there to talk home inspection, but we never miss an opportunity to talk about fireplaces and everything related to them. 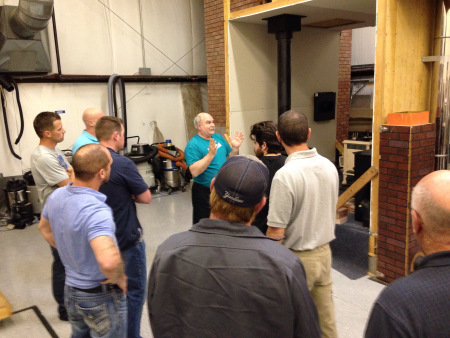 Thanks to Regional Chimney Supply, we’re offering a one-day CCS Review/Exam in Gaithersburg, Maryland on June 20. [This event was created due to demand in that mid-Atlantic by sweeps. Sign up information is here.] And we have a CCS review and exam June 26 in Natick, Massachusetts [information here] that was created after demand in that region. They asked, we delivered! Of course, we welcome scores of guests during Sweeps Week an annual free event being held this year from June 8-12. During this time, masonry and chimney sweep technicians help out with a variety of projects that range from labor — building a sidewalk — to construction of fireplaces. Each day gives the participant CEUs that can help to lead to their Certified Chimney Sweep renewal.